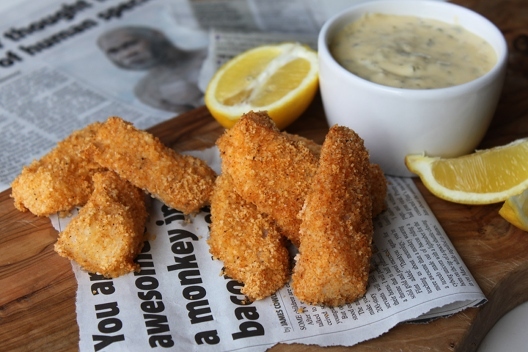 Almond Crusted Fish Sticks & Tartar Sauce Macnifique! Have you ever wondered what to do with your almond flour that is just too coarse for making macarons? Here is a super delicious and healthy idea! 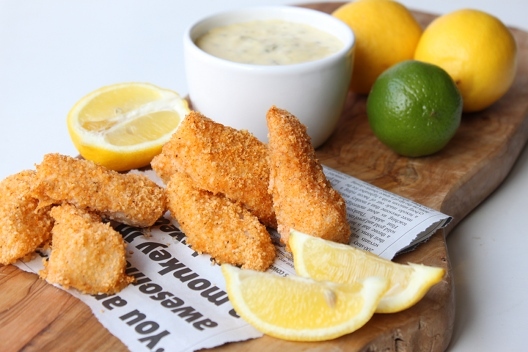 Who doesn’t LOVE a portion of fish fingers – especially when you have some tartar sauce to drench them in! 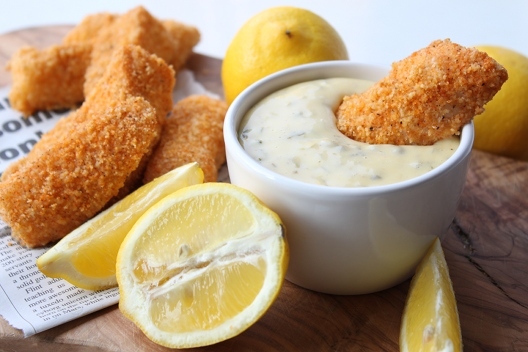 I reckon there are a lot of you out there whose parents fed them fish fingers far more than they should have, I know it certainly happens now. Parents feeding their kids breaded, processed ‘meats’ and ‘fish’ – it’s enough to make you sick! 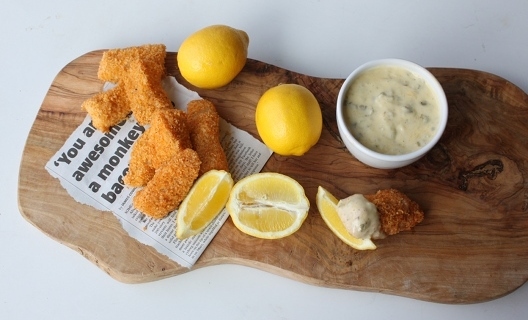 Fish fingers to me were more than just a quick weekday meal, even more than just a treat! 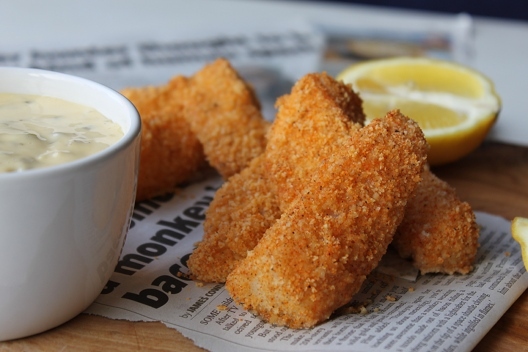 Fish fingers remind me of some very distinctive smells, emotions and tastes. My brother and I always got fish fingers when my parents went out with their friends for dinner. 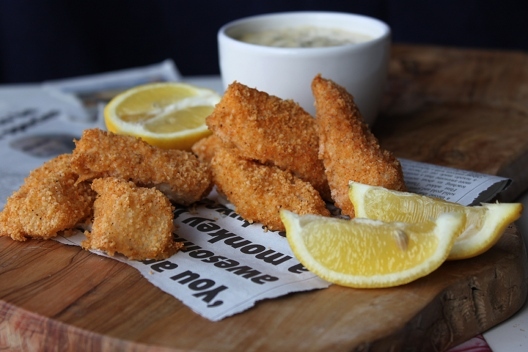 When I think of fish fingers – I think of the smell of my mom’s YSL Opium perfume, I think of the smell and taste of Koo tomato sauce, I also remember crying (because I wasn’t allowed to go out with my parents) but my tears were always wiped away with the promise of mighty fish fingers! Now that the sentimental story is out the way – let’s get down to it! These could be enjoyed as an addition to a buffet table, eaten as a snack or served with a side dish to round it off as a whole meal. Mo and I ate these with a portion of oven baked potato ‘fries’ (we need to work on those) but that was a special treat and I made sure to keep my carbohydrate intake low for the entire day in order to enjoy the potato. It’s been a long time since I’ve eaten potato. If you’re being good I recommend serving with a generous portion of long stem broccoli. You can pretend they’re fries! If you don’t like broccoli – you’re crazy! I think I can safely say that I will be trying these out next week.. especially the sauce, well more the mayonnaise as I’ve always wanted to make my own. Wow these fish sticks look amazing. 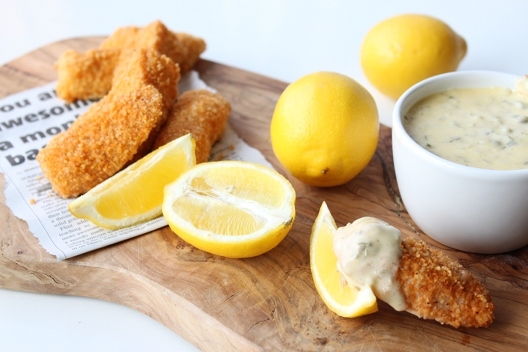 I can’t wait to try them and make the ultimate fish finger sandwich! Non-frozen homemade fish sticks with a tartar sauce made from scratch? Yes, please! The last time I had fish sticks was back in middle school when they served it at the cafeteria but I just haven’t had a chance to make a homemade version. Great idea!!! Crusts are one of the saddest parts of being gluten-free. Do you use this crust on other protiens? I've tried this with chicken too - works a treat! Can you use almond flour instead?